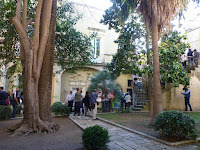 The Lecce Italian Language Experience: Don't delay for September. Flights are filling, and prices are going up. Don't delay for September. Flights are filling, and prices are going up. There are still a handful of places available for the 2015 Lecce Italian Language Experience for September. Do not delay if you want to join us in September. Prices are on the way up and now start from $6100. Prices are rising due to high booking rates in September for flights bound for Europe. In other words the flights are filling and the airlines do not have to heavily discount their fares to fill the aircraft. Prices are quoted in Australian dollars and are based on airfares available at the time of writing. As always enquiries from countries other than Australia are most welcome. Prices will be adjusted according to your local currency and airfares from your location. Open the following link for all the details.